At last, a non-scary clown! Unless you’re scared of clowns in general. But this clown isn’t creeping around the edge of town, following anyone home late at night or keeping a collection of knives… Unless you want him to, that is. No, this is just a good old-fashioned circus clown, down to clown around with face-painting kids, making balloon animals and gently guiding pony rides. 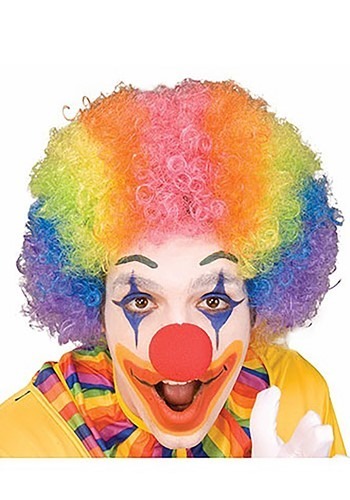 This is a clown you can trust with your kids! Unless you decide otherwise, of course. It’s all up to you. If you promise not to turn into a psycho who runs around stalking and killing people, we promise to send you this Rainbow Clown Wig. Don’t act like it couldn’t happen. There’s a reason so many 80s and 90s slasher films featured killer clowns: their writers were in touch with what was going on in America. That’s gotta be it. This Silly Clown Wig’s colorful ‘do is made from 100 percent synthetic fibers. It has a mesh netting interior to keep it snug over your regular, boring normal color hair. Nobody would think that’s fun. Or scary. Still can't believe the excellent quality of these purchases and for the price makes them incredible!